This new technology sets a new standard with regards to thermal imaging for both tactical and outdoors uses. It delivers better image performance and range while featuring reduced weight and a smaller overall design. ​Click here now to find the lowest price for the FLIR ThermoSight Pro PTS233 on Amazon! 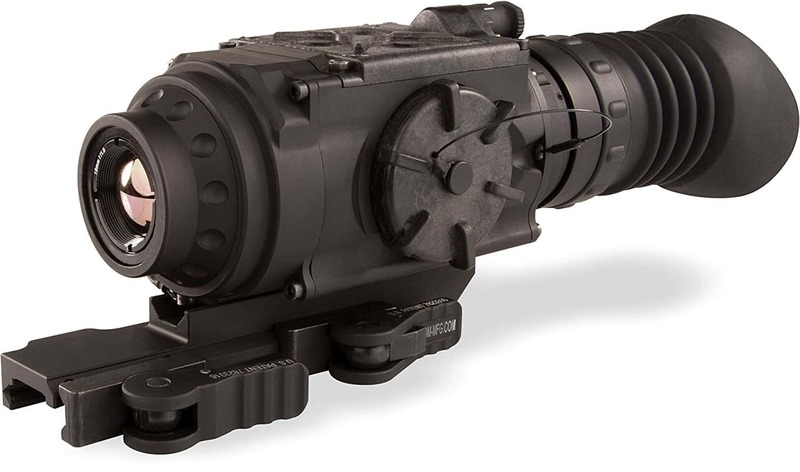 FLIR’s new sights feature a high-definition 1280x960 display. All video processing is performed on a newly designed chip that feeds the uncompressed video signal directly to the display. All these improvements help to improve object detection and classification during use. They offer a clean thermal image in any light condition. Detection and classification have been greatly improved in conditions ranging from low contrast daylight to total darkness. Even smoke, haze and light fog are no problem. The new sights come in three different models. They all feature Bluetooth 4.0 and USB-C connectivity. All are packing high performance and lots of features into a lightweight and compact design. The thermal resolution of each FLIR ThermoSight Pro is 320x256 pixels. Users can change and control the imaging palettes as well as filters to enhance the image. The sights offer onboard recording for up to two hours of video or 1,000 jpeg images. In addition the scopes offer a digital compass and inclinometer. Initially FLIR introduces the ThermoSight Pro PTS233. It features a reticle pattern that uses FLIR’s patent pending High-Visibility Technology (HVT). This delivers crisp iconology and graphic overlays over any kind of background. The ThermoSight Pro series will have three models. All sights offer a 4x digital zoom. The PTS233 offers a 19 mm lens. It has a 12 degree field of view. The sight offers a generous 3 inch eye relief and has dioptric adjustments from -5 to +5. The PTS533 will have a 50mm lens and a 4.5 degree field of view. The PTS733 in contrast has a 75 mm lens and a 3 degree field of view. Both these scopes are set to be available later in 2017. Both of these scopes will have higher performance levels while also growing in size and weight. The suggested MSRP of the PTS233 is $2,199. It is available now within the US.